Update, Dec. 2, 2013: Dan Greene, our lovely convener, has written a great wrap-up of our panel for the CUNY Academic Commons Digital Labor Group. His Panel Review briefly summarizes each speaker’s presentation. Thanks, Dan! Update, Nov. 27, 2013: Many thanks to Jen Jack Gieseking for Storifying the tweets from our panel! 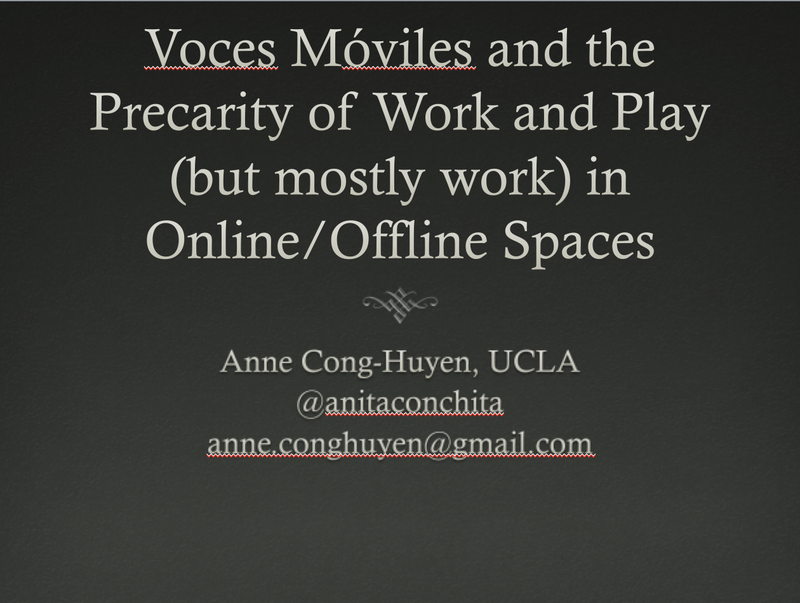 For those who missed it, here is the archive of tweets: “Identity Work and Identity Play Online”. Now, before I share my paper below, please keep in mind that our presentations were limited to 10 minutes, so I had to leave out quite a bit in terms of technical analysis of the Open Source content management system, Drupal, that VozMob is built on. More on that elsewhere. So much I still need to write about! In any case, here is my paper below. Enjoy! I want to start with a quick introductory note regarding my disciplinary background, which is in English/Literary studies, and my particular interest in labor as something represented in cultural texts, in addition I am invested in examining the material or affective labor that goes into producing those texts. Screenshot of http://www.discoverlosangeles.com, the official tourism portal of LA. …and pristine settings for which the city is famous. They seldom feature the workers who are necessary to the maintenance of these settings. Today, I’ll be focusing primarily on the most contingent of these workers, day laborers, who often work in the landscaping and construction industries that keep many parts of LA beautiful (mainly the residential parts). If seen at all, in mainstream media, they are in news items or independent media decrying the danger they pose to the city and its legitimate inhabitants, or questioning whether they should have certain rights. These were all major topics in recent months leading up to Governor Jerry Brown’s passage of laws granting undocumented immigrants major rights in California this past October. 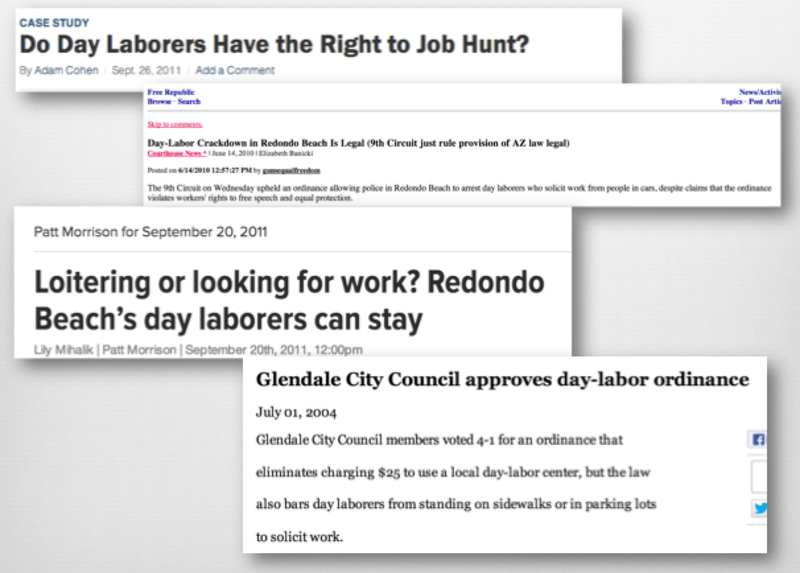 A sampling of headlines from a variety of publications re: day laborers. Generally speaking, however, characterizations of day laborers as disposable and contingent correlate with widespread labor trends in the U.S. since the 1980s, since then work has become increasingly more short-term, and more precarious. Day laborers are the most desirable of contingent workers because of their short-lived longevity in the lives of employers. They are also often characterized by an added element of illegality that works in tandem with problematic racial politics as these workers, especially in the Californian context and across the country, are regularly perceived as being undocumented immigrants or “illegal aliens.” Because of this perceived status, they are the most disposable of flexible workers, less valuable than other temporary workers that might be found in temp agencies or labor brokers, and often demonized because of it. They are more expendable because they’re not supposed to be here anyway. And yet day laborers are significant components of an invisible informal economy that operates to maintain pristine urban and suburban neighborhoods that often exclude these workingmen in any other capacity. Sociological studies that try to track these workers do important work in documenting these workers, but they tend to provide abstract and seemingly objective numbers that can only give us an idea of the scale of day labor markets. Unfortunately, they give us very little by way of the experiential or the subjective understandings of being a day laborer. Representations of day laborers, as I mentioned earlier, are rare, but even more rare are opportunities for self-representation. VozMob, short for Voces Móviles, or Mobile Voices, is one platform that allows for such activity. 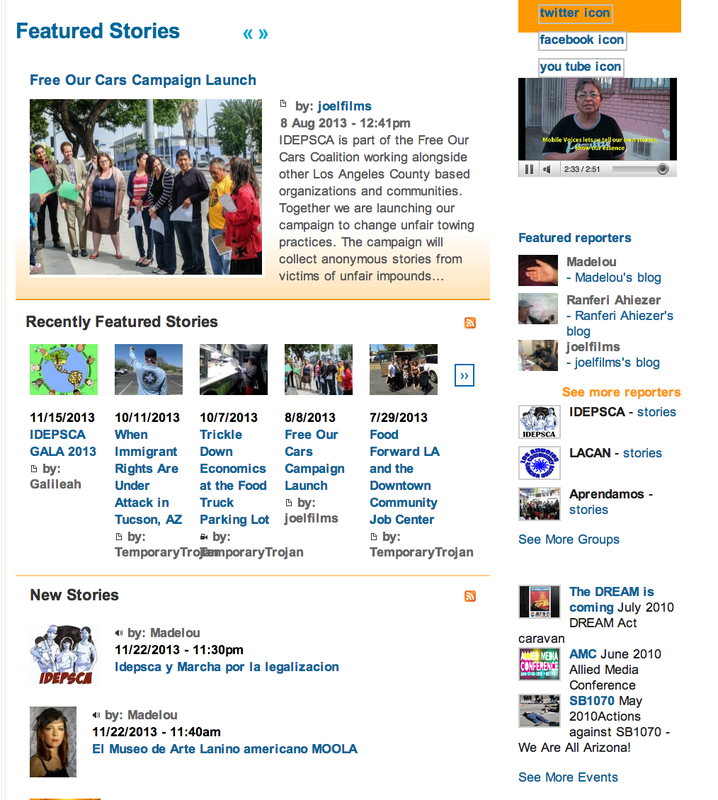 An ongoing and award winning[i] project, VozMob comes out of collaborations between researchers and activists from the USC Annenberg School of Communication & Journalism, volunteers and workers at the Institute of Popular Education of Southern California (or IDEPSCA), and the Los Angeles Community Action Network (LACAN). [ii] An extensive and complex text, I can really only introduce it briefly here, but will be happy to talk more about it during the Q&A. Screen capture of VozMob “About” page. 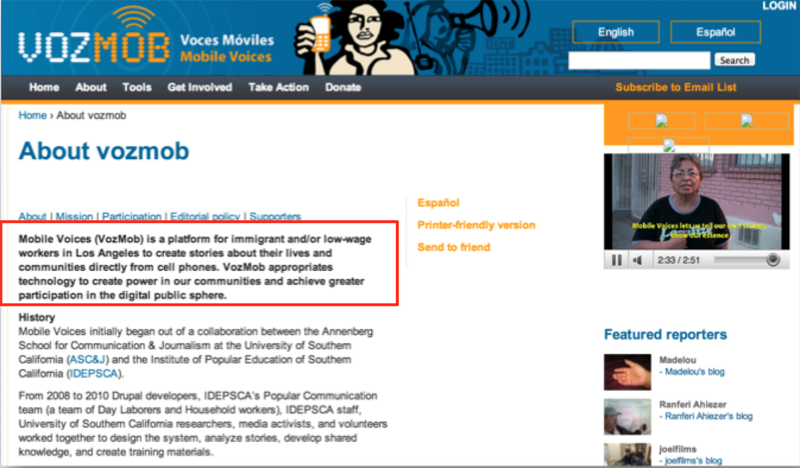 According to their “About” page, “Mobile Voices (VozMob) is a platform for immigrant and/or low-wage workers in Los Angeles to create stories about their lives and communities directly from cell phones. VozMob appropriates technology to create power in our communities and achieve greater participation in the digital public sphere.”[iii] Rather than telling a single cohesive narrative, like traditional familiar narrative genres, VozMob acts as an online platform through which multiple people or organizations can share information and media from a variety of perspectives. At the basic practical level, the project provides day laborers with inexpensive mobile phones to take photos, record audio and video, and then provides them with an online space to document their daily lives, their labor environments, community organizing etc. Equally important, is the provision of a physical space where the workers have access to computers and staff who can provide technical training, support, and emotional encouragement. The narratives produced incorporate photos, audio files, and short video clips that are published as blog posts, often with narrative annotations. The naming here, is quite important: much of the language of the site refers to these workers as jornaleros, the Spanish for day laborers, but the site officially gives them the title of Reporter or Corresponsales, highlighting their active roles in documenting their lives. More importantly, there is emphasis throughout on their mobility, movement, their lack of stability and stasis. Since some of these day laborers are immigrants, migrants, or un-documented workers who are often already fearful of immigration officials, law enforcement, and nativist community members, many of the bloggers remain relatively anonymous, only identifying themselves by their first name, a pseudonym, an unidentifiable avatar. Screen shot of front page showing multiple posts. Their posts are sometimes part of longer series, connecting images and text across a number of posts to relate a single narrative. These often are interrupted by unconnected posts published by others that may disrupt what would be single narratives. Other posts are published as stand-alone texts that communicate self-enclosed narratives that only need interpretation on the part of the site visitor. I’ll focus here on one of these standalone posts from April 2012, then featured on the main page. 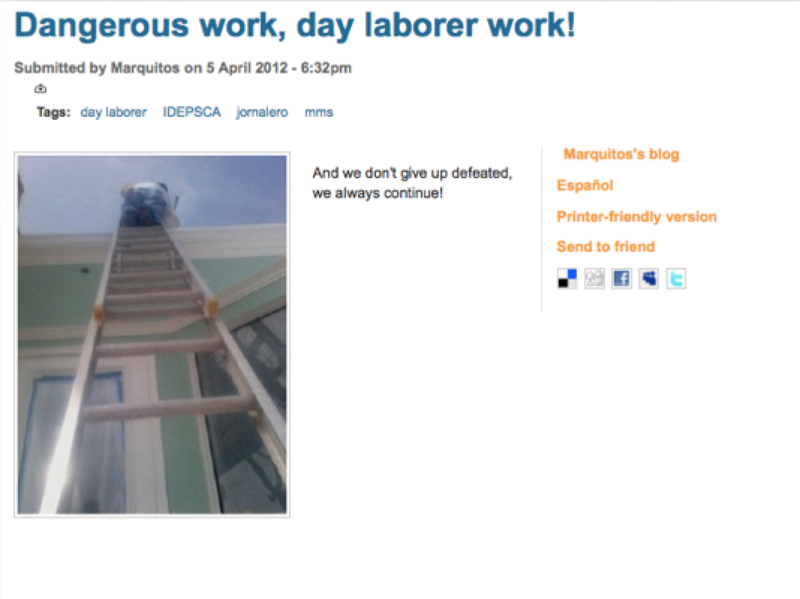 Titled “Dangerous work, day laborer work!” this one simply offers an image of a man on a ladder, photographed from below. Posted by a correspondent named Marquitos, the caption states, “And we don’t give up defeated, we always continue!” Like most of the images on the site, the quality is grainy and not extremely clear. Such aesthetics, a product of material circumstances, evoke the working-class demographics of the contributor, and the unsteadiness of the perceived photographer suggests that the image was taken in a stolen moment at work at a precarious jobsite. This photo, along with the exclamation, acts as a simple and clear statement to the sacrifice these workers make every day out of necessity. For them, work is dangerous, but it becomes part of their daily lives and identities, and the act of capturing their work and sharing it becomes a brave act of testimony, often associated with the defiance found in baring witness. The process of taking the picture, of writing, and of publishing all speak to the added labor of documentation on top of the physical labor on the worksite. This work produces a telling portrait, a single example among thousands of others, depicting the precarity of day laborers in a contained but open-ended narrative. The embedded nature of texts like this one in a website like VozMob has some arguable unintended effects, in addition to the primary functions of communicating the varied experiences of jornaleros: it documents their otherwise undocumented diversity, and it unsettles the stability of the reader, also making the reader feel precarious through the act of reading. (So overwhelming!) The aesthetics and storytelling characteristic of many of the posts, of which Marquitos’s image is one example, presents a challenge in reading and interactivity. For visitors to the site, it is often difficult to find natural cohesive narratives that tie the multiple perspectives together. The interface itself prevents narratives from being read as such, even if that is the intent of their authors. Marquitos, for example, here gives us a single captioned image that is one among thousands of posts, on over 660 pages, that have been collected over four years. Accommodating so many voices at once, the evolving nature of the project, the material constraints of the platform, etc. produce a great deal of noise. The labor and time required on the part of the reader to make sense of a story out of that noise is intense. The reader must spend time navigating the site, piecing together stories, and connecting them with the authors and contexts. The act of reading the blog, or even attempting to read it, requires an enormous investment of time. It reminds us, as readers, of the work that is necessary for day laborers to sustain themselves and their families, and of the added toil required of them to carve out a space where they can collectively struggle. There’s still much to discuss about VozMob, but I want to end by asking how we might examine these massive networked, collective texts and the work that goes into populating and sustaining them. How might this work help us to think through and complicate notions of embodied, physical, manual labor in relation to technologies so often imbued with liberatory power, this has become more fraught in recent years, where we often forget about the bodies who must build and maintain the infrastructures and tools that allow us to access and use these networks, or the physical spaces we pass through that are maintained and cleaned by invisible hands. For me, this text is so much about recuperating the bodies of workers who are put in danger in so many ways: racial violence, dangerous job sites, poor labor practices, unscrupulous bosses, lack of access to education, legal protections, food and healthcare, and perhaps most importantly, the potential danger that can come from trying to make visible people who are either invisible, or that others refuse to see. For a detailed report that tracks day labor growth in the nation, including socioeconomic issues that have led to its increase, particularly in Los Angeles, see Abel Valenzuela and Nik Theodore’s “Searching and Working: California’s Day Laborers and Worker Centers” published in California Policy Options by the UCLA School of Public Affairs. Full citation can be found in the works cited. [ii] Additional funding and sponsorship has also come from HASTAC (Humanities Arts Science Technology Advanced Collaborative), the MacArthur Foundation, the Social Science Research Council, and a growing list of affiliates.